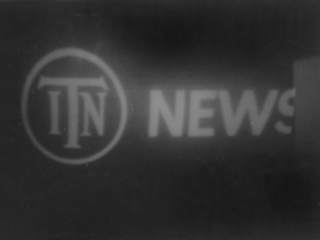 ITN was formed in 1955 to provide regular news bulletins to the newly formed ITV stations. 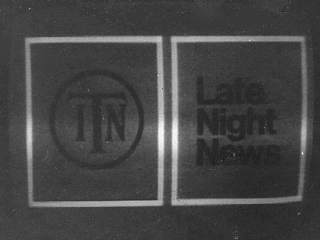 Before ITN became famous for News at Ten and the "bongs" of the headlines, their main news programme wandered around the evening and there was a short bulletin called the "Late Night News" at around 22:40. The funny item in the background of this 1967 off-screen photograph is part of a lunar landing module shown as a report in to the testing of docking procedures. 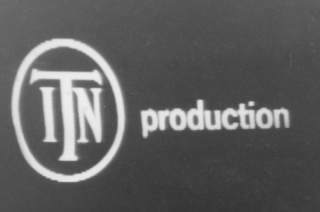 A simple ITN logo, we are unsure when this was used although it is clearly of the same vintage as above. At some point ITN changed their graphics. 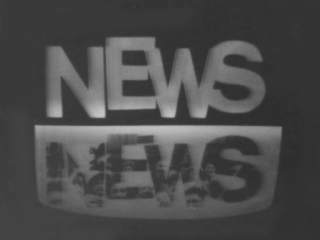 The logo stays the same but a new sans-serif font is introduced for the "News". In this example something obscured the screen when this was photographed. 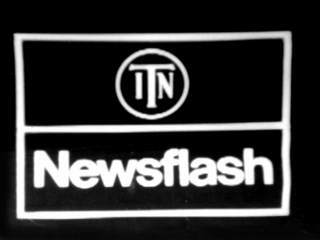 An ITN end slide from the same era as above. 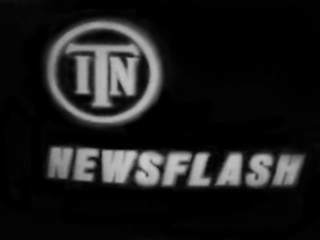 "ITN" is supposed to be in a circle, we don't know whether this distortion was as broadcast, or whether the TV receiver or camera were to blame. 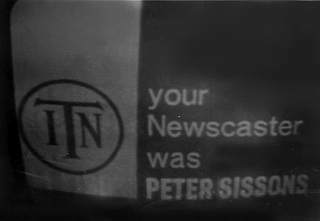 A sixties appearance behind the desk for Peter Sissons, who is now a BBC Newsreader. Interesting how the BBC tended to use the term "Newsreader" with ITN using the term "Newscaster". 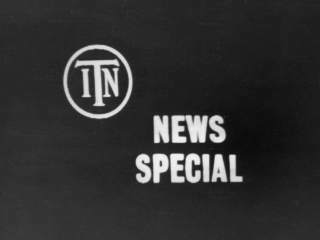 An ITN "News Special". Anyone any ideas what this might have introduced? Presumably one of the many important events of the sixties. 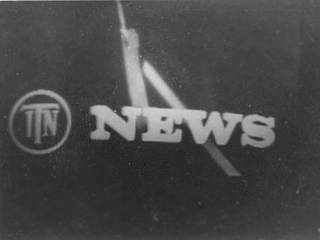 Today, most news is stage managed and planned weeks in advance, but in the early days, television had a lot to prove by being more up to date than the newspapers. 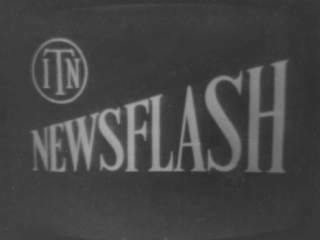 Hence the "Newsflash" was a much more frequent visitor to the screen, and there were many specially prepared slides ready to introduce them. 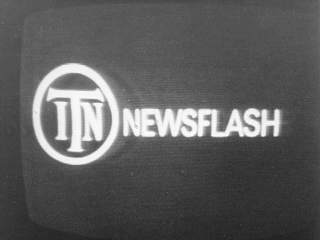 Another newsflash from ITN, in the style "ITN News 2" above. These photographs come from the days before video tape and PC capture cards. Someone had a camera set up and pointing at the screen in the hope of a Newsflash appearing. They had to be quick to get the photo taken before the newsreader appeared on screen. A very stylish graphic urging immediate attention from the viewer. We appear to be missing records of when these were taken, can anyone help identify the dates? 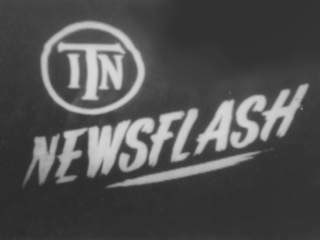 A change of layout for this ITN Newsflash graphic that has been enhanced from an off-screen photograph. And finally, another varaint on a Newsflash theme. These are not in chronological order, so it shouldn;t be assumed that there was any theme in the way the graphics developed. 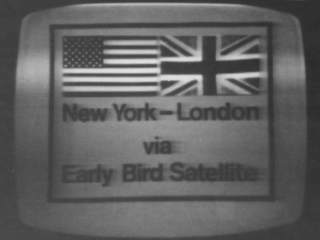 The first transatlantic satellite transmission? A very unusual graphic, which appears to be totally out of style compared to the others in this selection. Does anyone know what this was used for? 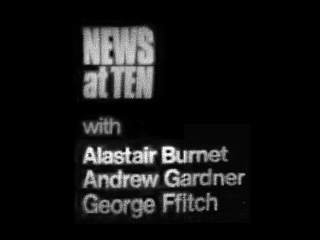 This is more familiar for todays audience, ITN were using similar end credits in the eighties, although they were in colour by then. The MHP is proud to support the Transdiffusion Project, from where these images originated.